Thanks to Start Up Loans and Appear Here, ZAAZEE will be on the high street in Leeds City Centre. Come check us out! ZAAZEE are delighted to have a 3-day popup at the amazing Lifestyle Fitness in Handforth. Come check us out! Jessie Pavelka, host of a number of US health programmes, has chosen Carden Park for his next work-out event in the UK. Come and join over 100 women for a fab health and fitness day, and check out some ZAAZEE gear too! McKinsey & Company is the trusted advisor and counselor to many of the world's most influential businesses and institutions. ZAAZEE are delighted to be popping up at their London HQ by Piccadilly Circus. Come and take part in a variety of low and high intensity group exercise classes including Clubercise, Body Combat & Pilates and check out some ZAAZEE kit while you're there! This event is for a great cause - raising money for Breast Cancer Research - and is part of the Sport England national “This Girl Can” campaign week celebrating women participating in physical activity. It's for the whole family so bring your mum, daughter, granddaughter or grandma! There's even free soft-play for the kids. Entry is just £10 for adults or £5 for anyone under 16. The UK's best-kept fitness secret. Join 15,000 women becoming healthier and happier. With everything you need to upgrade your lifestyle under one roof, you’ll train with the UK’s master trainers in a bespoke fitness studio, learn from the capital’s top wellness, nutrition and health experts, meet Olympic icons and discover over 125 hand picked premium brands including ZAAZEE. Come and check out ZAAZEE at the Run Expo in Manchester. Jo Pavey will take to the Run Stage to talk about her achievements – including winning her first ever major championship gold medal at the European Championship in Zurich. She made history by becoming the oldest ever European Champion at 40 years and 325 days. Entry to the Run Expo also gives full access to the Bike Expo, Swim Expo and Tri Expo. Whether you are a well-seasoned gym fanatic or are recently looking to start taking steps towards healthy living, Lifestyle Fitness are here to help. And in February, come and check out ZAAZEE's range of activewear and gymwear - exact dates & times to be confirmed. 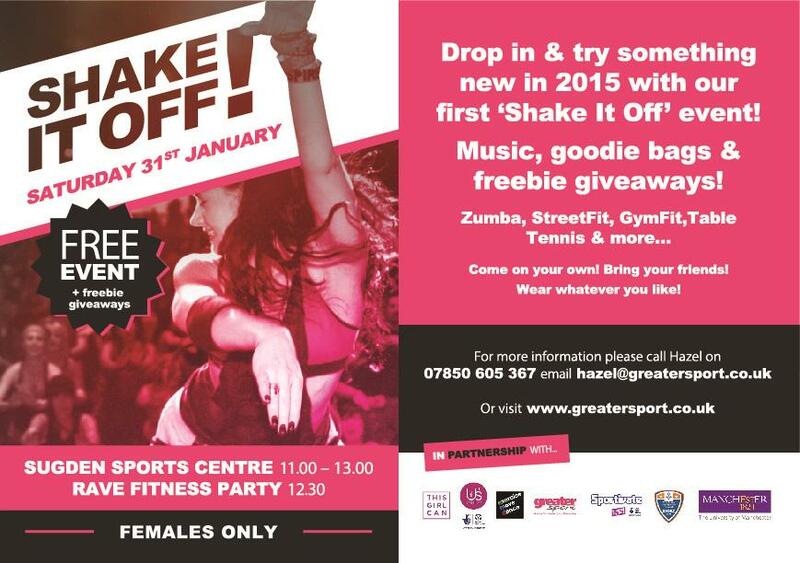 If you're a student at University of Manchester, Manchester Metropolitan University or Salford University come and check out ZAAZEE at the first GreaterSport Shake It Off event of 2015. Come and try Gymfit, Streetfit, Zumba and more, and of course see some amazing ZAAZEE activewear & gymwear.